Labnet is a worldwide provider of laboratory equipment with the goal of meeting and exceeding the needs of all laboratory technicians and scientists. Pipette.com carries a complete line of Labnet Pipettes including BioPette manual pipettes, Excel electronic pipettes, Fastpette Pipet Controllers, and Labmax and TritramBottle Top Dispensers. The Labnet BioPette Plus Pipette by Corning provides all the essentials for accurate and precise liquid handling. The design is made to comfortably fit in your hand regardless of right or left handedness, and has a finger hook to optimize single hand operation. Corning carefully selected the body and materials to make the Labnet BioPette Plus by Corning lightweight and well balanced – perfect for repetitive, continuous, and everyday use. The Labnet BioPette Plus Autoclavable Pipette provides superior accuracy, precision and reproducibility and has an adjustable volume range with thumbwheel or push-button. The Labnet BioPette Plus Autoclavable Pipette is a lightweight and well balanced digital pipette that has a digital micrometer. The BioPette Plus from Labnet provides you with exceptional comfort during use. The Labnet BioPette Plus Autoclavable Pipette is designed to fit naturally in your hand, whether you’re left or right handed. The Labnet BioPette Plus Autoclavable Pipette has a finger hook that gives you comfortable single-handed operation for everyday use. The Labnet BioPette Plus pipette is a fully autoclavable digital pipette, equipped with a slender shaft for universal tip fit and available in single, 8-and 12- channel models. 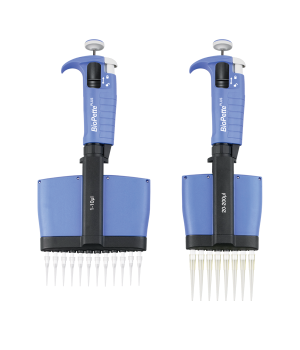 The Labnet BioPette Plus Multichannel Pipette maintains excellent accuracy while standing up to the wear and tear of constant use. 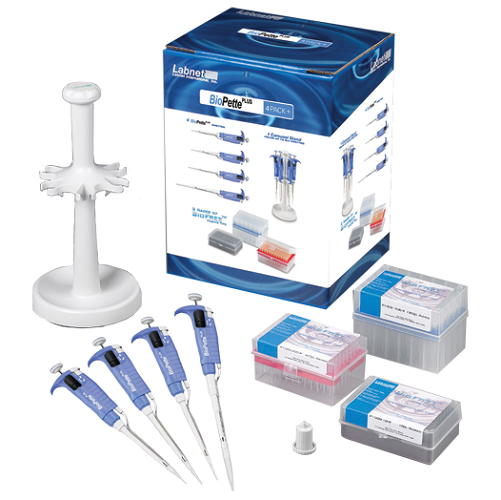 The Labnet BioPette Plus Multichannel Pipette is ideal for any lab. These precision pipettes are designed for exceptional comfort and accuracy. Lightweight and well balanced, this Labnet multichannel pipette fits comfortably in either the right or left hand with the large digital display visible to the user. Chemically resistant, maintenance-free seals and finely polished pistons provide unsurpassed accuracy sample after sample. The continuously adjustable, digital micrometer of the Labnet BioPette Plus Multichannel Pipette is slightly recessed to prevent unintentional change. The multichannel pipette from Labnet is protected from the effects of thermal expansion by the insulated body of the pipette. For convenience, the volume can also be adjusted by turning the push-button. Ergonomically positioned, the tip ejector reduces fatigue during prolonged use. Labnet Excel Electronic Pipettes are multifunctional units with operational modes for standard and reverse pipetting as well as multiple and sequential pipetting, mixing of samples and serial dilutions. All functions are easily programmed with one hand on the well positioned display and keypad. A fully motorized piston drive and auto-calibration guarantee excellent accuracy and reproducibilty. A removable, rechargeable Lithium-ion battey ensures many hours of performance between charges. The body of the pipette has been designed to fit comfortably in the right or left hand. Along with being lightweight, the unit is also well balanced. The plunger button, located on the back side of the instrument, requires just a small movement of the index finger to activate, reducing the risk of Repetitive Strain Injuries (RSI). The tip ejector slides easily with slight pressure from the thumb.